I treated myself a few weeks ago to a potters wheel, and it has become my de-stressing tool of choice. If you"throw" a pot and try to push it, chances are good it will implode and it's all over. Today was a good day - I ended up with three items that almost look like something. Usually you sign your pieces to make them yours, and I decided that this was the year I wasn't going to be as embarrassed and came up with a way to make them uniquely mine. 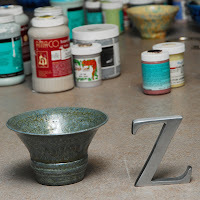 Z has always been my signature - if you are looking for an alphabet item chances are good z will be the hardest to find. Instead of signing my pieces underneath, I've chosen to stamp the inside of each item with a z. So now, if you see a slightly uneven bowl with a z in the bottom, you'll know who made it.Choosing what your Signature Style is should be about letting people know what you are about, and what your lifestyle is. It doesn't have to be complicated - it should just be about you.